1. Salmon farmers never shovel their manure, they just let it fall through the nets. Think kitty litter box, that never gets changed. Thousands of tons of feces and other waste on the seafloor around the sites that is never removed. 2. 600,000 Atlantic salmon swimming in a soup of mucus and excrement - breeds pathogen mutations that enter the ocean and the supermarkets. 3. A US scientist studying toxins in farmed salmon told the media, "One should avoid farmed salmon like the plague." 4. 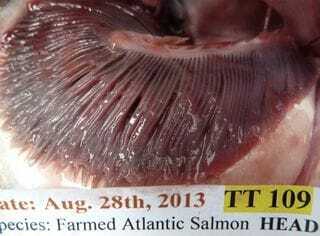 Farmed salmon are colored pink to imitate wild salmon. 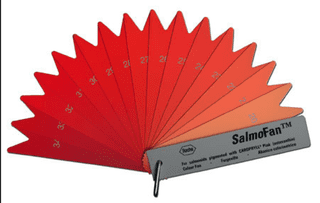 Producers use the Salmo Fan to pick what color they want the fish to be. The colorant is added to the feed. 5. 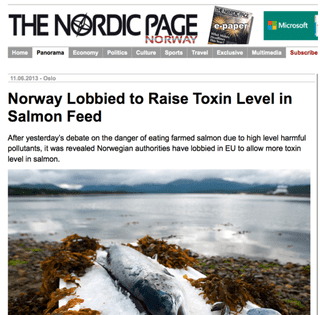 In April 2013, Norway got the European Union to allow 10xs more Endosulphan in farmed salmon feed. This is a pesticide banned in many parts of the world because it is so dangerous to human health. 6. 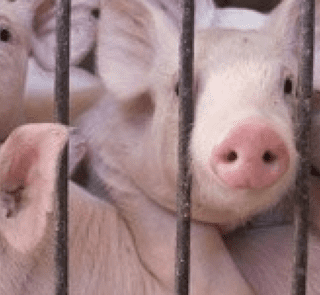 If farmed salmon feed contains pig by-products, is smoked farmed salmon Kosher? 7. 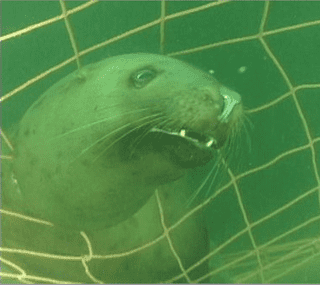 Seals, sea lions and birds become trapped and drown in salmon farm nets. 8. Farmed salmon cannot feed the world because they use more fish than they produce. Farm salmon eat pellets made of fish, grains, chicken by-products and oils. 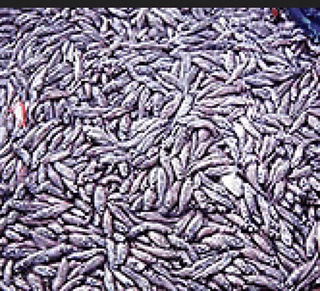 They contribute to fishing pressure driving wild stocks towards extinction. 9. 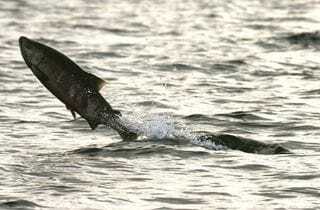 Wild salmon have gone into decline everywhere salmon farms operate. 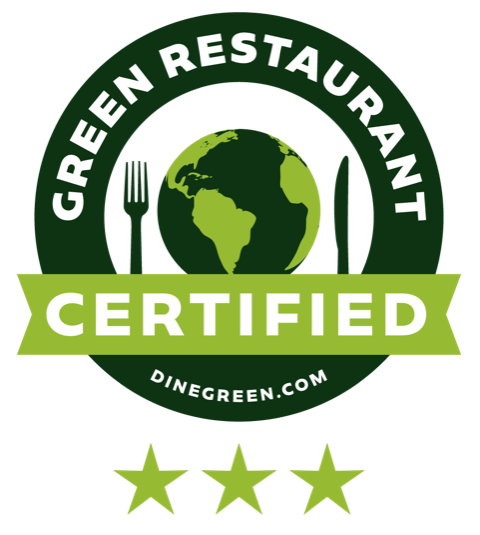 This damages coastal economies and life in our coastal oceans. 10. 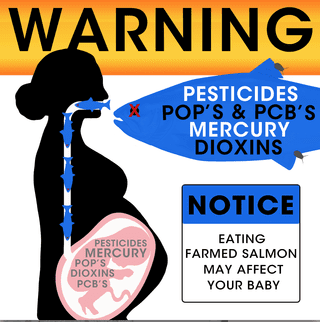 Norwegian doctors warn mothers not to eat farmed salmon because the high levels of toxins in farmed salmon are known to be damaging to the developing brains in babies. Dr. Anne-Lise Bjørke Monsen risked her career to bring us this news. 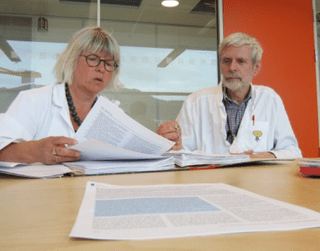 Toxicologist Claudette Bethune was fired by Norwegian government for trying to warn the public about high cadmium levels. Since so many people eat farmed salmon hoping it will benefit their health, it is important to check out what these women have to say. 98% of salmon farms in British Columbia, Canada are Norwegian. 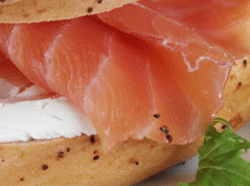 Norway farms salmon in Norway, Chile, Canada, Scotland, and the Faroe Islands.